I read this book back in July 2018 and I found it remarkably compelling, but I still didn’t want to cut the cord entirely. I resisted. I’m a writer. I’m supposed to do social media, right? Isn’t that how we all sell books in the 21st Century? 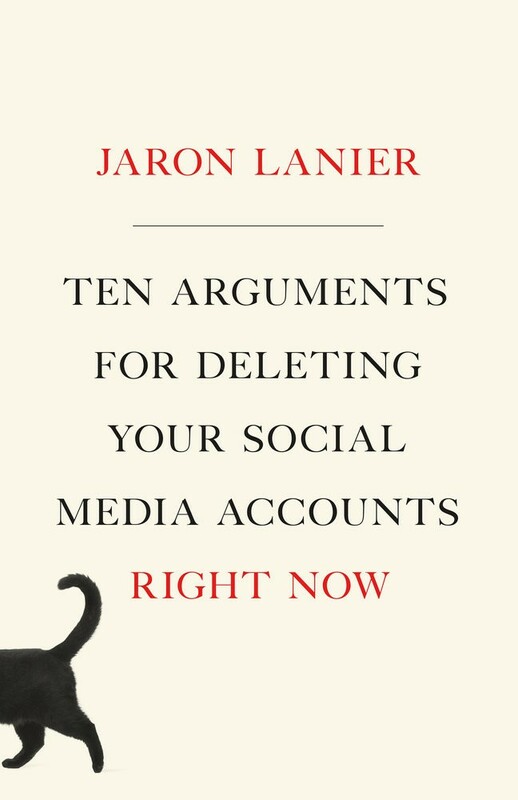 But as Jaron Lanier describes in this book, I hated seeing how the apps on my phone drove my behavior. Specifically, I’d post something to Twitter or Instagram, and then I’d anxiously check back later in the day to see how many people “liked” it. I had become, as he explains, a needy little dopamine junkie. And I didn’t like it. And reading his description of the science behind that impulse, I noticed what I was doing, and hated it even more. So, end of December 2018, I just went around and deleted a bunch of accounts: my three longtime Tumblr blogs, the Pinterest, the Google+. Those were easy because I had stopped using them. Tumblr was bittersweet because I had a lot of content there. It was my primary blog for a long time, but even those posts were easy to archive and download. Facebook was easier—I’d never been on it in the first place. Then it came to the two really hard ones: Twitter and Instagram. I used these the most. I had enjoyed Twitter for many years though I was never a power user (only about 4,000 Tweets in eight years, maybe?). Since the election I hated being on that platform, but I could see how useful it could be to my professional life. I had started to drift to Instagram, anyway. I know people have their issues with that platform as well but I dug it. i liked snapping a photo, putting it up with or without a clever caption, and then checking back to see the likes. I also liked seeing what my friends were up to. Real friends, people I actually knew. So after some thought, I finally just did the easiest thing. I deleted the Twitter and Insta apps from my phone but did not delete the accounts. I would do what so many others do — just take a break from those two. And then I deleted the annoying news app on my phone that I was always checking. With all those apps off my phone, I felt weird, like I didn’t have anything to do when I got that fidgety play-with-my-phone feeling—a feeling, I might add, that I never had prior to 2007, when I bought my first iPhone. So without apps to check, I promised myself that if I unlocked my screen for no good reason, that I would read a few pages of whatever ebook I’m currently reading. This approach has done wonders. Read a 200,000-word novel in January that would have been unthinkable under the old system. I don’t know how long I’ll stay away from social media. It may be a hit/miss kind of thing. I was on Twitter just a day or so ago to post news of my latest short story sale, and ended up making a discovery that I’ll share with you soon. I recommend checking out Lanier’s book. His arguments are compelling, and he reveals himself to be a fundamentally decent person who wants us to want the best for ourselves and our loved ones. If you want to sign up for my newsletter and claim the free book, hop on over. Newer PostThe Arge Files: Have a Racy Valentine! Older PostCheck out my new story in Mystery Weekly!